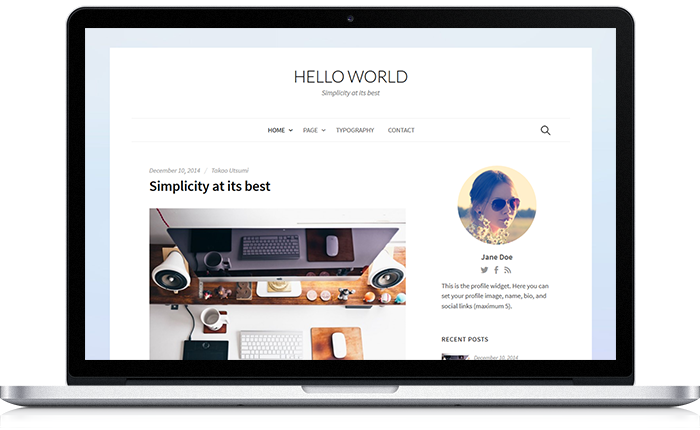 Hello World is a simple but high quality WordPress blog theme. From WordPress beginners to experts, it's made for everyone who wants a simply beautiful blog. Hello World is a theme that has a high quality feel while remaining simple. Unnecessary frills have been cut out and emphasis has been put on attractive layouts and typography. It’s recommended not just for male users, but female users as well. Hello World is made to be easy to use even for new WordPress users. Hello World is perfectly functional from the moment you enable the theme. You don’t have to fight with the Customizer or pages to get the theme working. Hello World offers excellent customization while remaining simple. In addition to 7 widgets and 4 menus, you can also set custom headers and backgrounds. Furthermore you can also modify various theme options including fonts, colors, layout, title, and logo through the Customizer. 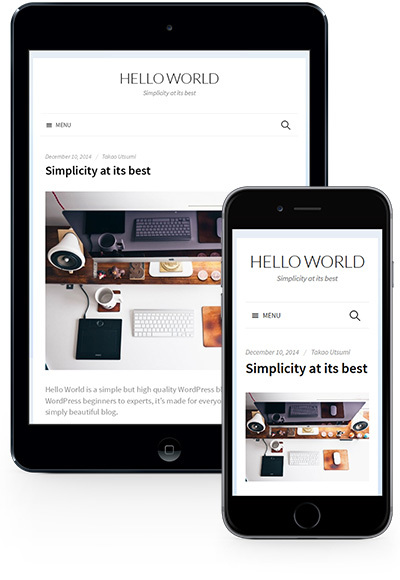 Hello World was built with mobile-first responsive design in mind, so it offers a pleasant reading experience on both smartphones and tablets. Hello World allows you to modify various theme options including fonts, colors, layout, title, and logo through the Customizer. Hello World comes with 2 sidebar and 4 footer widgets. Furthermore, it also features a widget area that follows posts. Hello World supports 4 menus: Navigation Bar, Header, Footer, and Footer Social Links. You can choose which menus to use or not use. Hello World allows you to set a custom header and display an image at the top of the page. Additionally First also supports custom backgrounds, so you can freely change your site background. Hello World supports 3 page templates: a Normal Page, a No Sidebar Page, and a Full Width Page, allowing you to create flexible pages. Hello World supports the multifunctional plugin Jetpack which adds features like widgets and infinite scrolling, as well as the contact form plugin Contact Form 7. Hello World supports multiple languages. Currently supported languages are Japanese and English, and typography has been appropriately adjusted with CSS for Japanese. Hello World is made with people who want to customize its code in mind and adheres to WordPress standards while maintaining clear, readable code.